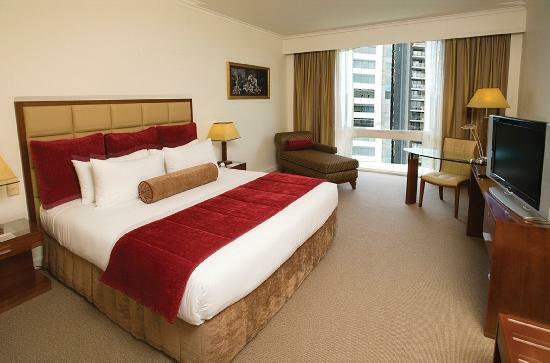 The Royal on the Park Hotel is perfectly positioned in the very heart of Brisbane CBD. Guests who choose to stay here will be spoilt by the luxuriously appointed rooms which overlook the Brisbane River and Botanic Gardens. The Royal on the Park Hotel is within easy walking distance to Brisbane city centre, South Bank, Brisbane Convention and Exhibition Centre, Casino and the Riverside Centre. travellers who are searching for discount hotel rooms in Brisbane should look no further than the Royal on the Park Hotel. This budget property features a variety of hotel rooms that have been specifically designed for both business and leisure travellers. It also has great amenities like a lounge bar, business centre, child minding, conference centre, currency exchange services, direct internet access, faxing facilities, guest laundry, fitness equipment, lift, restaurant, room service, secretarial services, spa, outdoor swimming pool, tour desk, garden, 24 hour reception, baby cots available for families, babysitting service and daily housekeeping. Guests will find the rooms elegant and contemporary, and the personalised service provided by the friendly staff legendary. City View Deluxe Room : Sleeps up to 2 guests on 1 King Bed. Deluxe City View Twin Room : Sleeps up to 2 guests on 2 Queen Beds. Deluxe Park View Twin Room : Sleeps up to 2 guests on 2 Queen Beds. Executive Spa Suite : Sleeps up to 4 guests on 1 King Bed + Double Sofa Bed. Luxury Spa Suite : Sleeps up to 4 guests on 1 King Bed + Double Sofa & Rollaway Bed. Park View Deluxe Room : Sleeps up to 2 guests on 1 King Bed.